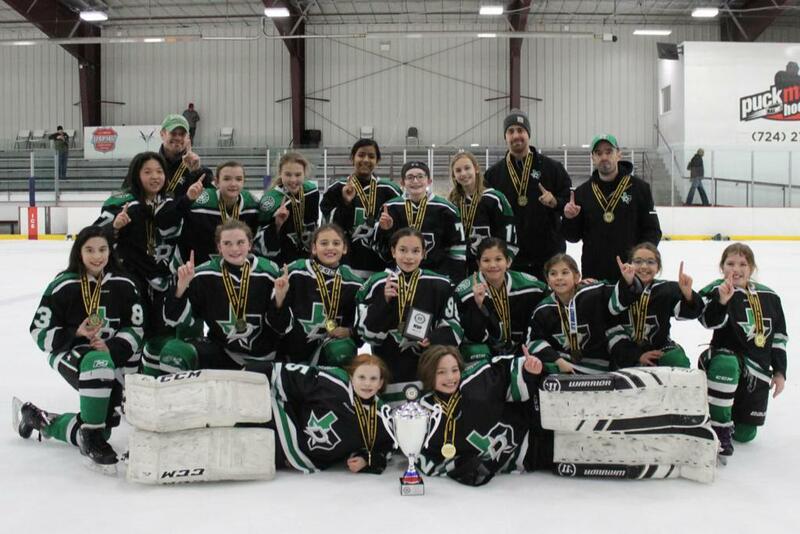 The U14 Tier 2 girls rolled through the U12-U14 bracket at the Three Rivers Cup in Pittsburgh with a 3-1 record, taking the championship with an exciting 3-1 win. The girls had much to celebrate after winning the first two games 11-1 and 9-0 against Amhearst Youth Hockey U12 and the Harford North Stars. Madalyn Liles and Skye Gonzalez each had hat tricks in the first game and Gonzalez had another in the second game while goalies Mackenzie Sunderbruch and Callie Blissett combined for a shutout. The Northern Virginia Ice Dogs gave DSE a wake-up call in the third game shutting them out 0-4. But DSE came back strong against them in the championship to take the 3-1 win. Madalyn Liles earned the championship game MVP award with the game winning goal and the game puck went to Mackenzie Sunderbruch with a 0.960 SV%. Congratulations U14 Tier 2 on your win!